Meaning we can not add Facebook App as a custom tab to your pages as before. According to Removing App Profile Pages on Facebook Developer Blog, Facebook announce officially that they will remove App Profile Page on February 1st, 2012. In order to solve this issue, there is a way called Add Page Tab Dialog that allows you be able to add a Facebook app to an eligible Facebook Page that you are an admin of. Of course, there no need any required permission. 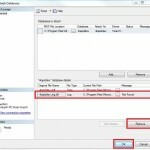 + _your_url_: the URL that the user will be redirected after clicks the Add Page Tab or Cancel buttons on the dialog. It could be the Canvas URL or Canvas Page.